1 May 2009, at 9:57a.m. UK - Aviagen has published its new Ross broiler manual. 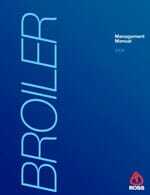 Aviagen has announced the publication of their new Ross broiler manual. To reflect the continued genetic improvement of Ross products in aspects such as broiler health, welfare and performance, the new manual pays specific attention to key areas of broiler production, including chick start, environmental management and pre-processing requirements. Alison Keaveney, Global Head of Technical Transfer said: "The objective of the manual is to provide our customers with the most up-to-date information to allow them to optimise the health, welfare and performance of their Ross stock. "The Ross broiler manual has always been regarded as the most comprehensive in the industry and is a vital part of the tool-kit we supply to all our customers and partners across the globe. Updating the manual is a time-intensive process, involving all technical teams and the study of performance of millions of birds around the world. The local technical teams interact daily with customers worldwide, at all stages of the chicken production process. This experience, as well as commercial flock data, provides the basis for all of our recommendations. Local technical managers will, of course, be available to offer further advice and tailor these recommendations to specific circumstances." The new manual has been designed to be user-friendly and practical, and is available now – e-mail infoworldwide@aviagen.com or contact your local Aviagen technical representative.